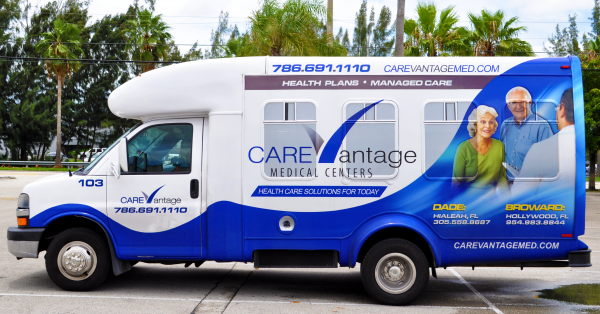 Believing that great service should extend beyond the walls of our medical centers; Carevantage has a complimentary transportation service to assist it’s patients to and from their appointments. Providing round trip non-emergency transport to any Carevantage facility or ancillary provider our chauffeur’s are on call to convenience our patients to the best of their ability. Our tailored service was designed to create a synergy between the patient and their driver. Maintaining the same route on a daily bases, patients can expect a phone call from their driver prior to his or her arrival as well as assisting patients with door to door service. While we know that some patients require more assistance than others a majority of our buses are wheelchair accessible in order to comply with those patients difficulties. Televisions and wide seating allow patients to feel as comfortable as possible during their trip. Furthermore, our drivers are in constant contact with the medical center so they anticipate the arrival of one or more patients on board.